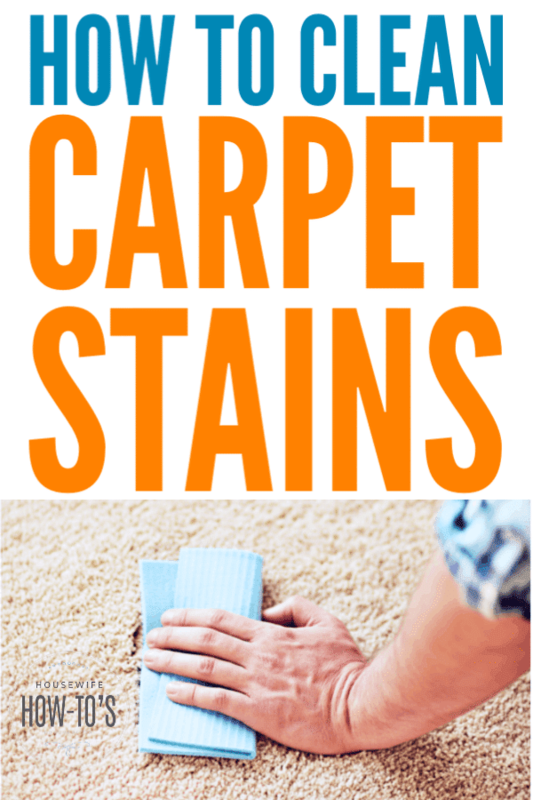 Carpeting is wickedly expensive to replace, so it’s important to know how to clean carpet stains the right way. A stained carpet can make your home look dirty even when everything else is clean. 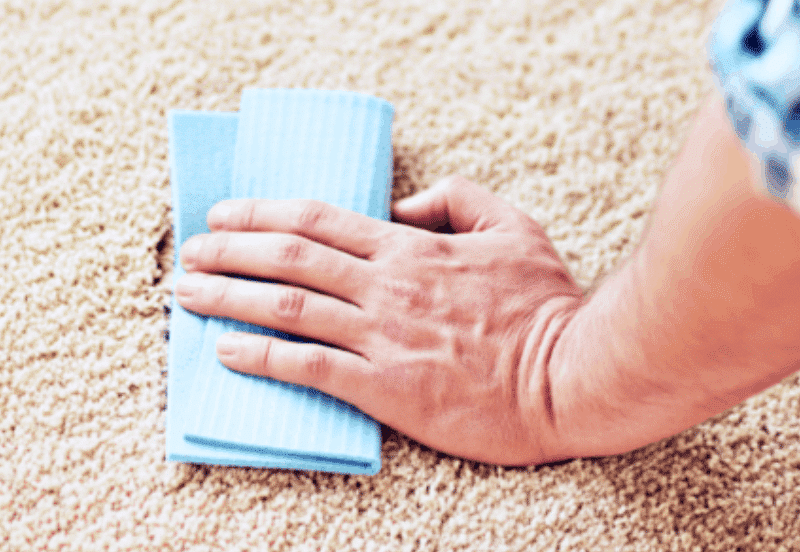 Fresh carpet stains from food, beverages, pets, grease, and other substances will usually come up warm water and a small amount of liquid dish detergent. (I use Dawn Original. In the UK, try Sunlight Dishwashing Liquid.) If this doesn’t completely remove the stain, immediately move onto one of the methods below, so the mess doesn’t have a chance to set. Clean any remaining stain with a solution of 1 part white vinegar to 3 parts hot water. Spray the area and blot the stain away with a clean, white cloth. Rotate the fabric as you work so you aren’t spreading the mess. Blot up as much of the spill as possible, then dab with club soda and a clean cloth. For stubborn stains, mix 1 tablespoon of clear household ammonia in 1/2 cup of water. Spray on stain, but don’t soak the carpet padding beneath. Dab it with a clean cloth, rinsing and changing your fabric often as the stain transfers to it. Once the stain is gone, clean the area with fresh water to remove the remaining ammonia then blot dry. Blot the area until it’s dry to touch. Sprinkle with 1/4 cup of baking soda and rub this into the stain. In a small bowl, combine 1 cup hot white distilled vinegar, 1/2 cup hydrogen peroxide (3%), and 1/2 teaspoon of liquid dish detergent. Have a stack of clean, white cloths handy. Slowly pour the soapy vinegar over the stain. The bubbling chemical reaction between the vinegar and baking soda will pull the stain out of the carpet fibers. Once you’ve finished pouring, blot the stain away. Let dry then vacuum. 1. First, see if warm water with a few drops of liquid dish detergent can lift the stain out. Use a clean, white cloth and change it frequently as you work. 3. Stain still there? Use 1 part clear household ammonia and 3 parts hot water. Spray on, scrub into the rug with a stiff-bristled brush, and use the ironing-transfer process described above. Be sure to spray with fresh water and blot with a clean towel to remove the ammonia then let it dry and vacuum thoroughly. We have two toddlers and bedrooms with very light carpet so we have lots of stains. We were thinking of having the carpets professionally cleaned. Worth the money? If it’s stained all over then, yes, a professional cleaning is probably worth it. My carpet has a few old stains on it and so I really appreciate your advice about using liquid dish detergent, vinegar and water to get the stain out. However, I am a little nervous about what might happen if I need to use ammonia. Will ammonia change the color of the carpet? I’m glad that you mention trying regular soap before anything else. It is amazing how much comes out without much effort and a little bit of soap. However, I am a big fan of using a steam cleaner for really old inset stains. It normally takes a couple of passes, but a lot of the stain comes up. However, if I end up with a really big stain or a lot of them I normally just let a carpet cleaning service take care of it for me.